I have had three new years in the past three months, maybe two to many but always good to end another new year on a high, and that is how I feel today after cutting the grass in the fruit cage and sorting out the edges after cleaning up the summer raspberries, I took off the growth from the year before and tied in last years growth which will fruit this next summer. I also cut back the canes so they put growth into fruit. Happy new year again all. 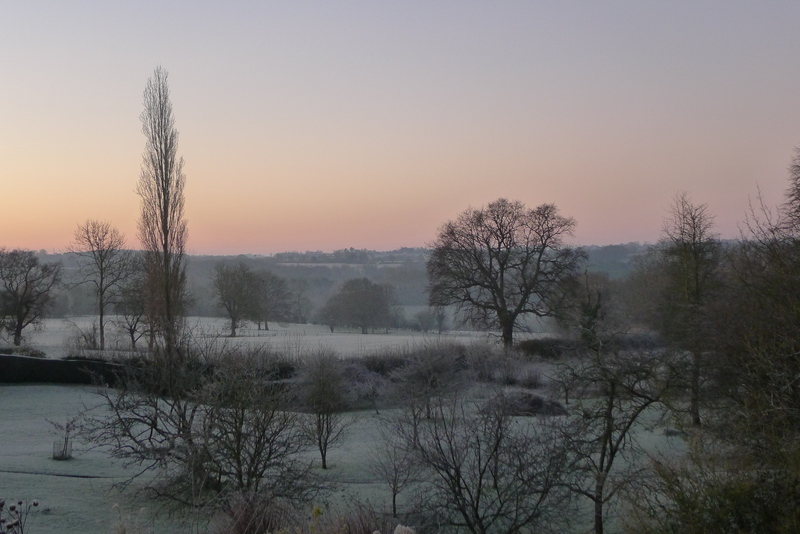 I am very happy to open my curtains and see this view, we have had another hard frost which is just what we need, they saw it is going to become mild again, these frosts will help to hold things back, and maybe we will get some more frost soon. 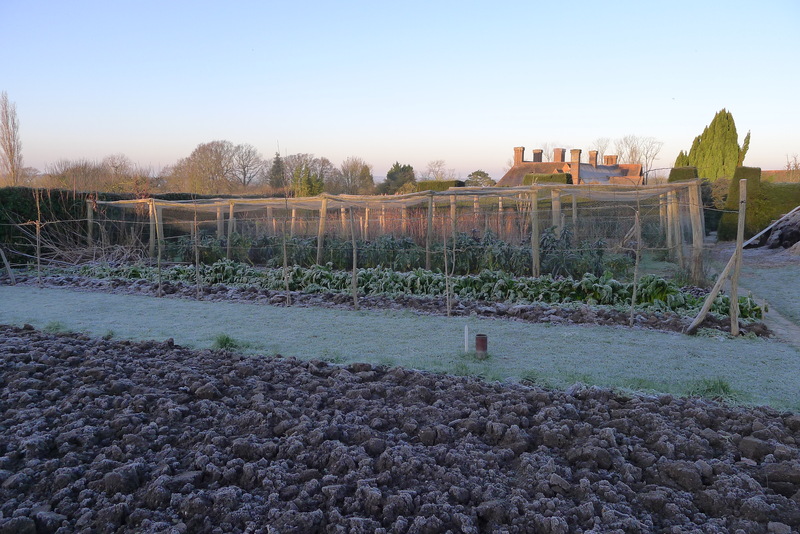 I hard better get dressed and out there, a day of work in the fruit cage for me. We are having nights of frost, I think it is about time. I got my row of tulips in on Christmas eve, thank you Shira for your help and Laura for the bulbs. The frost is going to be perfect for them, but it also gives the plants a rest and kills off the bugs. 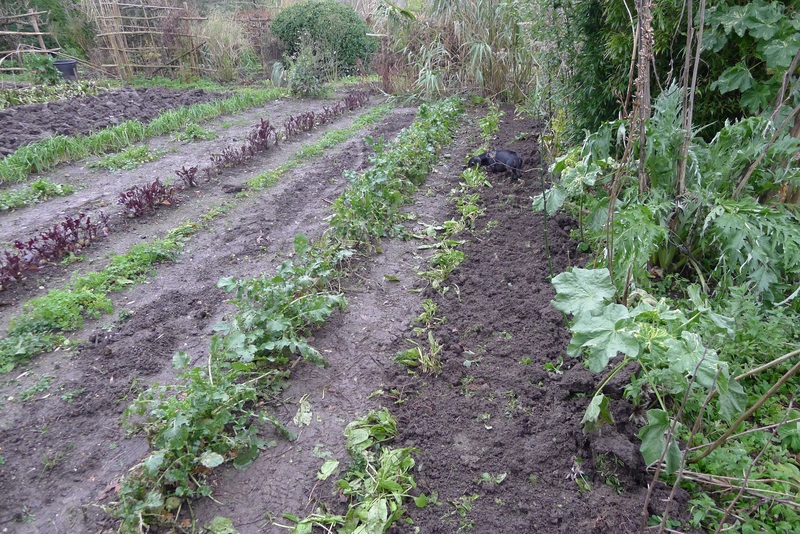 It does mean that it is hard to get into the soil but there are always jobs to do above ground, like the cleaning up and putting new twine on the trained pear trees, they still need a little work but are already looking a lot better, I planted the row of tulips under them. 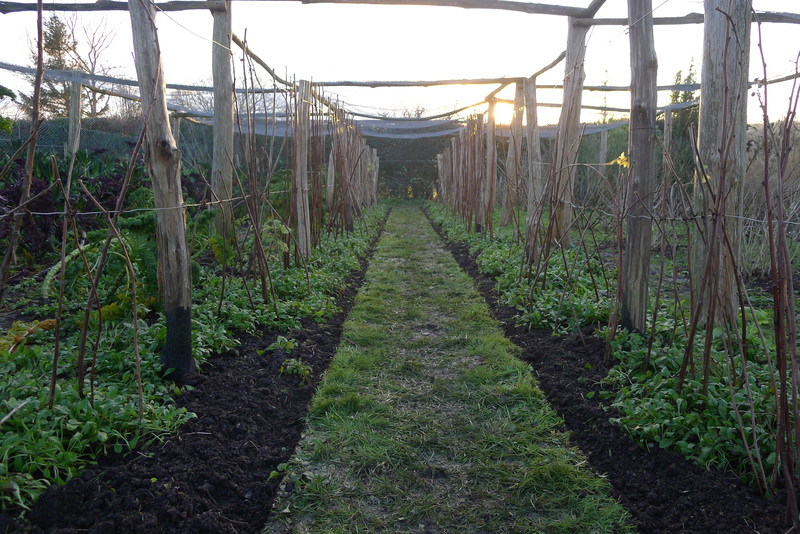 It has also meant that I have started to sort out the fruit cage today, more on that tomorrow. If you want to go back to work feeling good on a Monday morning, then end the week pleased and that is how I felt for most of the afternoon, I felt like that when I got up from planting the sorrel, but my mood did change a little when I saw that Miscanthus was digging a few of the sorrel plants up, not sure what she was looking for this time but it is great to have the sorrel in its new area. Now a few days of rain will settle it in. I got the train down from London at midnight last night and had to clear ice off the windscreen to drive home, I was very happy to have this because at that point I hoped we would have a good frost, and when I took the dogs out in the morning there was a good frost on the ground and clear sky. 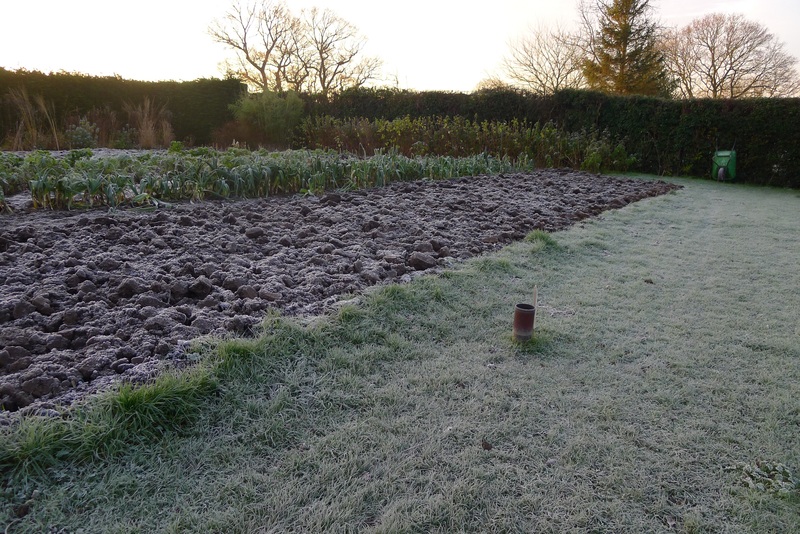 Frost is so important to break down the soil in winter and also to kill off pests, this is why I am winter digging. 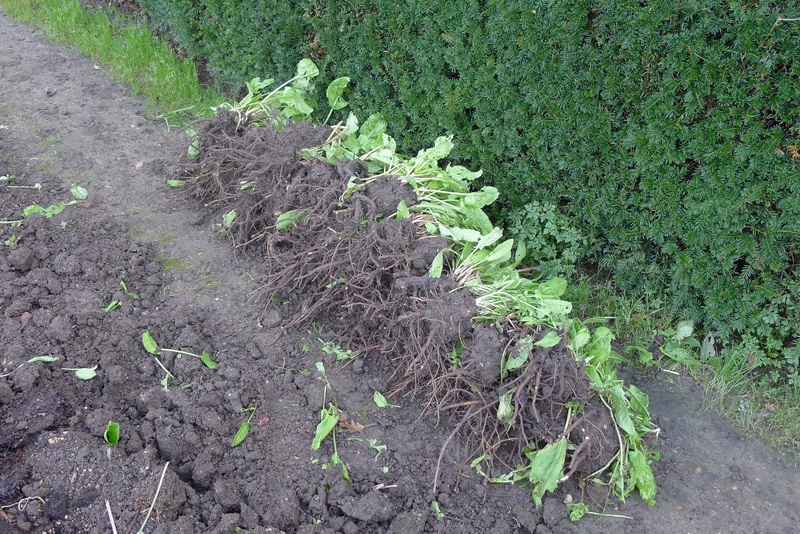 I have found it very useful to lift the sorrel at least every two years if not every year and today was the day I carried out the job, I keep it in the high garden but move it from one side to the other. I have found doing this helps stopping it from running to seed so much, it is also a good time to cut it back and clean it up. I have had different e-mails asking questions about winter digging, I will try and answer them. I feel this maybe one of the most important jobs of the year, to have the soil right helps more than most other things. 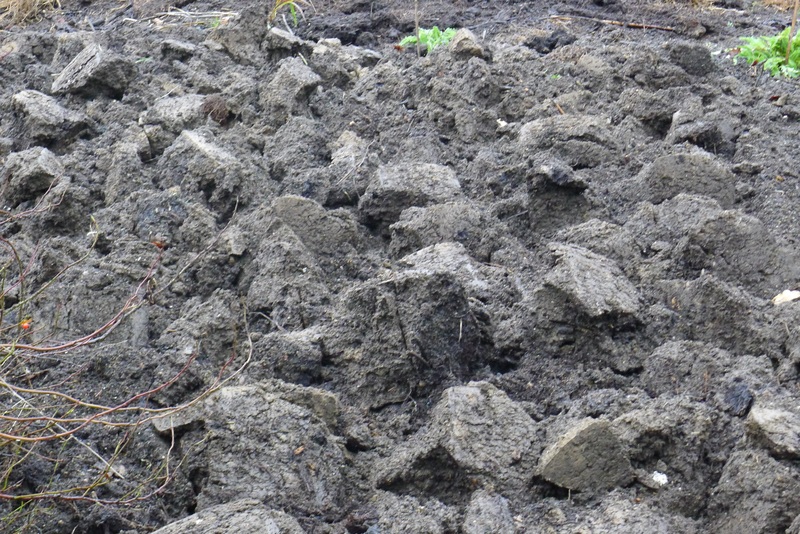 To have a good deep rich soil you need to add organic matter deep and this takes getting on the end of a spade and digging it in, you want to tun it over and leave the soil in as big a clod as you can so that you have more surface space for the frost to get to, it also does not pan in the winter rains if left in large clods, the soil I dug today was very broken up already because we had the potatoes on it last summer and they get down deep and break up the soil, it will not over winter as well but it does not matter as long as you still get the organic matter in deep, the soil has been dug here for just over 100 years but we still bring clay to the top, it means that we are getting in nice and deep. The other great thing about winter digging is you work off the extra weight, my nurse will be happy. The photo is what you want the ground to look like at the end of the day.